THE ROAD SAFETY Authority has advised road users to be careful on the roads tonight and tomorrow after Met Éireann issued a number of warnings for rain. 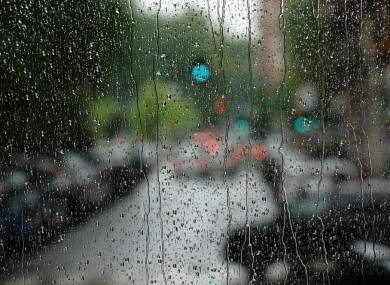 Met Éireann issued three yellow weather warnings for rainfall across 12 counties. Rainfall of 25-40mm is expected between 6pm today to 6pm tomorrow in Carlow, Kilkenny, Wexford and Wicklow. The same warning has been issued for Galway, Mayo, Clare, Limerick, Tipperary and Waterford between noon today and noon tomorrow. A 24-hour warning is in place for Cork and Kerry beginning at 11am today. Met Éireann forecasts that rain will extend to all areas of the country and will be heavy in most areas throughout the night. Further rain will continue to fall over Leinster and Ulster tomorrow. Munster and Connacht will be drier and brighter. The rain will clear in the northeast during the afternoon and evening. The RSA advised motorists to check national and local weather updates over the weekend and to also check local road and traffic conditions before making a trip. Motorists are told to avoid driving through flooded roads and to always follow recommended routes and obey signs closing roads to traffic. People are advised to watch out for washed out roads, earth slides, broken water or sewer mains, loose or downed electrical wires, and fallen or falling objects. Temperatures will range between 7 and 10 degrees. However, it will be frosty in some parts of the country tomorrow night as temperatures drop as low as -1 degree. Sunday is forecast to be a mostly dry day, but Met Éireann says active weather systems will begin to encroach from the north-Atlantic by the evening and heavy rain will extend across the country after dark. The weather is expected to become blustery and showery on Monday, with sleet and snow increasingly more likely. The wintry showers will mainly hit the north and west of the country, but all areas are at risk of thunderstorms. Temperatures will drop as low as 3 degrees. No snow-ice warnings have been issued by Met Éireann yet. However, the UK’s Met Office has issued a Status Yellow snow-ice warning to Northern Ireland for Monday and Tuesday. Email “Motorists advised to take care as 3 separate rainfall warnings issued”. Feedback on “Motorists advised to take care as 3 separate rainfall warnings issued”.